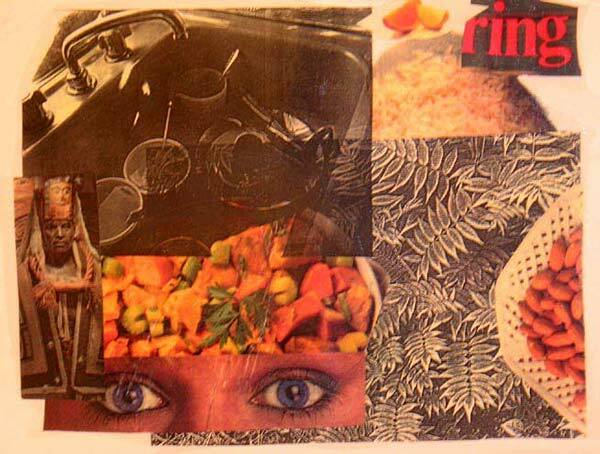 Date: 1992-93 Medium: Collage, 1992-93, each approx. 11 x16"
The content of the earlier collage work was a parody on the phrase, "You are what you eat". This work was influenced by readings on quantum physics, vedant theory and practice. It is also a continuation of the concerns of my earlier works into the nature of identity and the true self. The collage element was brought in as a symbol of Self; identity is seen as indivisible from the total collective self, no matter what form did the work. I was attempting to create in a pure and random way, to express the absoluteness, the indivisible and the unspeakable nature of life. I also used some of my own photographs in these collages, or larger negatives created using the copy camera at the U. of Sask, in Saskatchewan, where this series began. This series was part of the inspiration to go towards more training on computers. It was around this time that I was able to receive training in photoshop and desktop publishing, and a general introduction to computers, the early form of the internet, which I found fascinating. File sizes etc. were still a major concern, so given this issue and not actually owning a computer, it was not until 1995 that I was able to purchase computer equipment to experiment on. By that time I was consumed with the Icon show interviews.